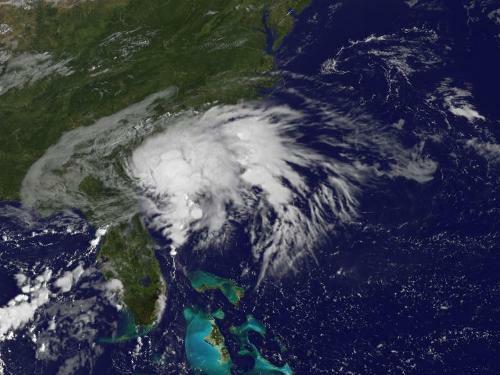 Tropical Storm Julia weakened into a depression and is expected to meander off the coast of Georgia and South Carolina for the next few days, the U.S. National Hurricane Center said on Thursday. Julia is located about 60 miles (95 km) south-southeast of Charleston, South Carolina with maximum sustained winds of 35 mph (55 kph), the Miami-based weather forecaster said. “A slow and erratic motion is expected over the next couple of days, and the track forecast keeps Julia meandering offshore of the Georgia and southern South Carolina coastlines into Saturday,” the NHC said. Julia, the 10th named storm of the 2016 Atlantic hurricane season, was moving northeast at 2 mph just off the U.S. coast, as little change TO its strength was expected during next two days, it said. Heavy rain combined with high tides raised concerns of flooding in downtown Charleston, South Carolina, and other coastal parts of the state into Thursday morning, forecasters said. Some residents in coastal communities were offered sandbags to prepare for flooding in low-lying areas. Since late Tuesday, Julia has dumped heavy rains and toppled trees in the region, but has not caused significant damage, the National Weather Service said. On Thursday morning, the hurricane center also was tracking a tropical depression that was expected to bring heavy rains to the Cape Verde islands off West Africa. On its forecasted track, the system would remain far away from the coastal United States through early next week.